Hey guys! So last night I had a craving for pasta salad. I had just left a very fulfilling and kinda weird Girls on The Run practice. It was our last practice before the big 5k this Saturday. A couple of girls and I led the pack. We had just circled the school almost 4 times (about 2 miles). We were on track to probably run another 2 laps before practice ended; another mile to almost complete a 5k. Then the fire alarm of the school sounded. We stopped and everyone was in a bit of a panic. What do we do? Everyone in the building had to evacuate. We were almost at the front, so I asked them to run the rest of the way with me. They were in and we ran our hearts out. It was awesome! On the way home, I really wanted pasta. Then I thought about veggie pasta. But I was so hot, so maybe I wanted something cold? OHHHHH, pasta salad, just like in the summer!!! 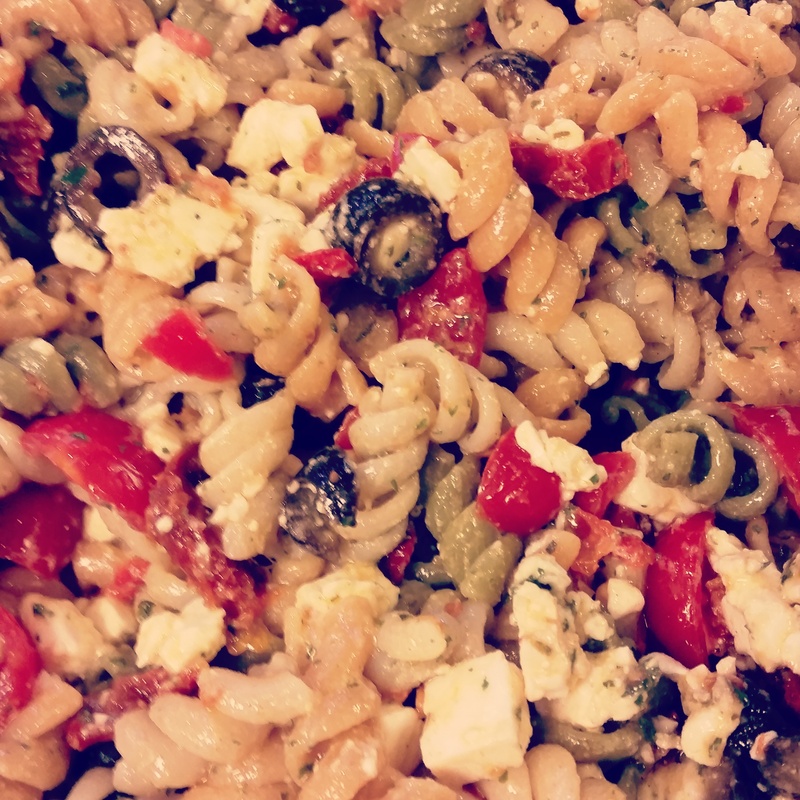 I thought of last July 4th when I made an awesome pasta salad that everyone loved and gobbled up…https://funfoodiefamily.com/2014/07/05/make-it-your-own-boxed-pasta-salad/ So I made this, except I added sun dried tomatoes and feta cheese. SO GOOD!!!!! !